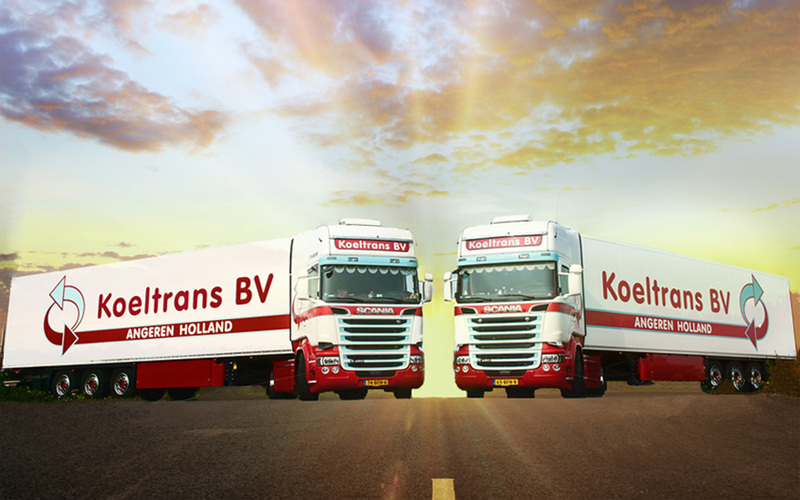 Koeltrans BV is a young and dynamic company staffed by enthusiastic, well-trained people who give a hundred percent every day to deliver your products on time and in perfect condition. Extensive logistics and transport solutions form the core of our company – from purchasing logistics through to delivery. We are a young and highly dynamic transport partner. Despite the fact that we started out in 2010, the transport world holds no secrets for us. Our specialities are conditioned transport to and from Germany, with daily departures – at temperatures ranging from -20 to +20 degrees. But you can also call on us for shipments to France or Switzerland. Your product deserves our full attention. Perfect conditions; clean cargo compartments, properly conditioned. The temperature during transport is constantly checked and registered by means of sensors inside the trailer. Because our vehicles are fitted with on-board computers linked to this temperature control system, we can provide you with the correct information at any moment of the day. Our experienced team will take care of your product all the way. Transport is intimately connected with packing – and we are experienced in both. Packing records are consistently updated in our system. The number of Euro-pallets and CC trolleys, shelves and poles are meticulously recorded and communicated. As an exporter, we also keep cask records for you. For us, quality goes without saying and quantity is not a problem. Thanks to our experience, we are up to date on the many factors that can influence transport and we are prepared for them. We strive for perfection and are only satisfied when your product is delivered safe and sound to the satisfaction of both sender and recipient. Our mission is to transport your goods and deliver them to your customer in perfect condition. We are only satisfied when the sender and recipient are too. Every day, we have the drive to make what we have even better. That work is never done – standing still means going backwards in all areas; ICT, Equipment, Employees, etc.! Ultimately, we want to create a team that thinks in the same way in order to achieve healthy growth for this company year on year. People who contribute their own ideas and share the same objective. These people are an inspiration for the company! I am always right at the heart of things within Koeltrans – despite the fact that I am the owner, I want to know everything that is going on within our firm. From the way in which our vehicles are washed to jumping on the fork lift truck myself to unload one of our lorries. First and foremost, I have operational responsibility for daily planning and managing the drivers. But my daily work also involves staying on the lookout for new opportunities and potential customers. Conditioned consolidation service and complete shipments to and from Germany.